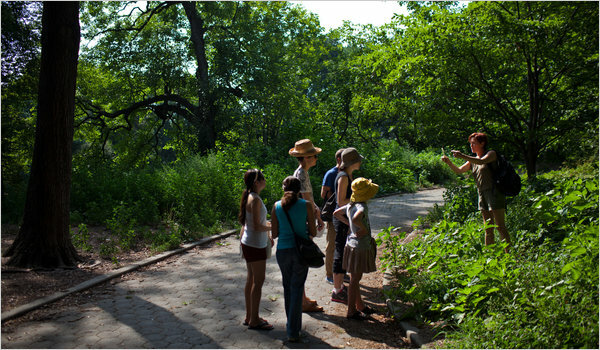 Leda Meredith, right, who wrote a book about eating locally on a budget, leads tours in Prospect Park about foraging. Maybe it is the spiraling cost of food in a tough economy or the logical next step in the movement to eat locally. Whatever the reason, New Yorkers are increasingly fanning out across the city’s parks to hunt and gather edible wild plants, like mushrooms, American ginger and elderberries. Ruby Harris, 9, of Brooklyn, inspecting an edible plant on a foraging tour of Prospect Park. Now parks officials want them to stop. New York’s public lands are not a communal pantry, they say. In recent months, the city has stepped up training of park rangers and enforcement-patrol officers, directing them to keep an eye out for foragers and chase them off. “If people decide that they want to make their salads out of our plants, then we’re not going to have any chipmunks,” said Maria Hernandez, director of horticulture for the Central Park Conservancy, the nonprofit group that manages Central Park. My grandfather spoke to me this week. That would’ve been unremarkable if not for the fact that he died four years ago. I had ducked into a movie theater to escape the maddening debt-limit debacle. I chose “Captain America: The First Avenger.” Surely that would reset the patriotic optimism. But as I watched the scenes of a fictitious integrated American Army fighting in Europe at the end of World War II, I became unsettled. Yes, I know that racial revisionism has become so common in film that it’s almost customary, so much so that moviegoers rarely balk or even blink. And even I try not to think too deeply about shallow fare. Escapism by its nature must bend away from reality. But this time I was forced to bend it back. It was personal. The only black fighting force on the ground in Europe during World War II was the 92nd Infantry Division: the now famous, segregated “Buffalo Soldiers.” My grandfather, Fred D. Rhodes, was one of those soldiers.